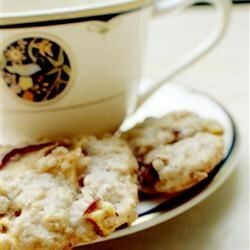 A delicious fruity variation on oatmeal cookies. In a large bowl, cream together the shortening and sugar. Beat in the eggs until well blended. 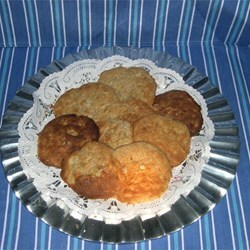 Combine the flour, baking powder, cinnamon, nutmeg, and salt; stir into the sugar mixture until well blended. Fold in the walnuts, oats and apples. Drop dough by spoonfuls about 2 inches onto ungreased cookie sheets.